The Ministry of Public Health (Ministerio de Salud Pública, or MSP) of the Dominican Republic organized the High-Cost Medicines Program (Programa de Medicamentos de Alto Costo, or PMAC) in 2008[i] to facilitate clinical care for patients with very rare diseases and high-cost treatment, such as cancers unresponsive to conventional treatments, rheumatoid arthritis, hepatitis C, and kidney transplants, among others. 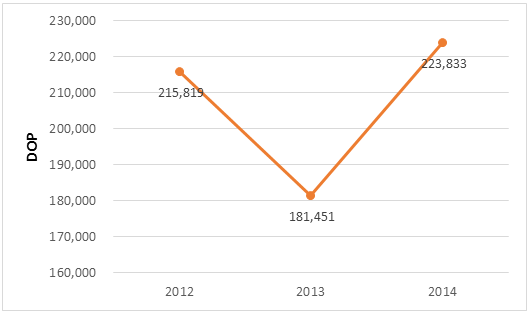 In 2012 this program was estimated to provide care to 5,171 beneficiaries. The principal item of expenditure of this program is medicine. When the Systems for Improved Access to Pharmaceuticals and Services (SIAPS) Program began to analyze the cost and financing of medicines in 2011, it determined that the planned budget for the purchase of high-cost medicines in 2012 was DOP 1.395 billion (USD 35 million). 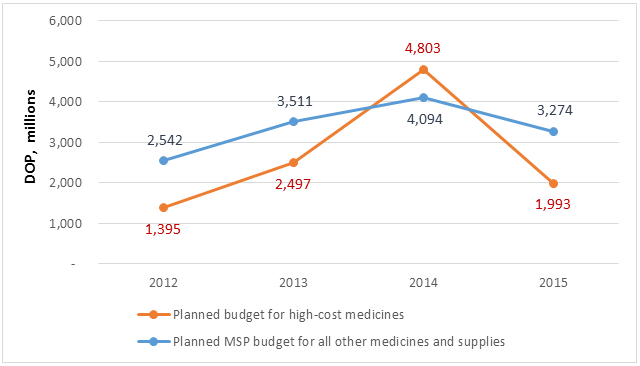 The estimated cost for the procurement of high-cost medicines in 2014 was 3.4 times greater than in 2012 (DOP 4.803 billion; USD 108 million), surpassing the MSP’s planned medicine budget for the rest of its programs for disease control, hospitals, and primary care units (DOP 4.094 billion; USD 92 million) (figure 1). If one considers that in 2014 the number of PMAC patients was 10,687, the average annual PMAC cost per patient for medicines was DOP 224,000 (USD 5,053) (figure 2). In 2012 the MSP requested technical assistance from SIAPS to revise the list of 98 high-cost medicines as a strategy to optimize and rationalize expenses. The implemented strategy consisted of two steps. The first step was a review of international reference lists[i] and scientific literature performed by a pharmacoepidemiologist to identify the therapeutic benefits, safety, costs, and potential alternative therapies for the products included in the list. Using this information, the pharmacoepidemiologist recommended a product’s continued inclusion, exclusion, or substitution. The second step was a workshop for reviewing and validating the proposals, performed by a group of consultants who included clinical specialists who serve as PMAC advisers and international consultants with expertise in the area. 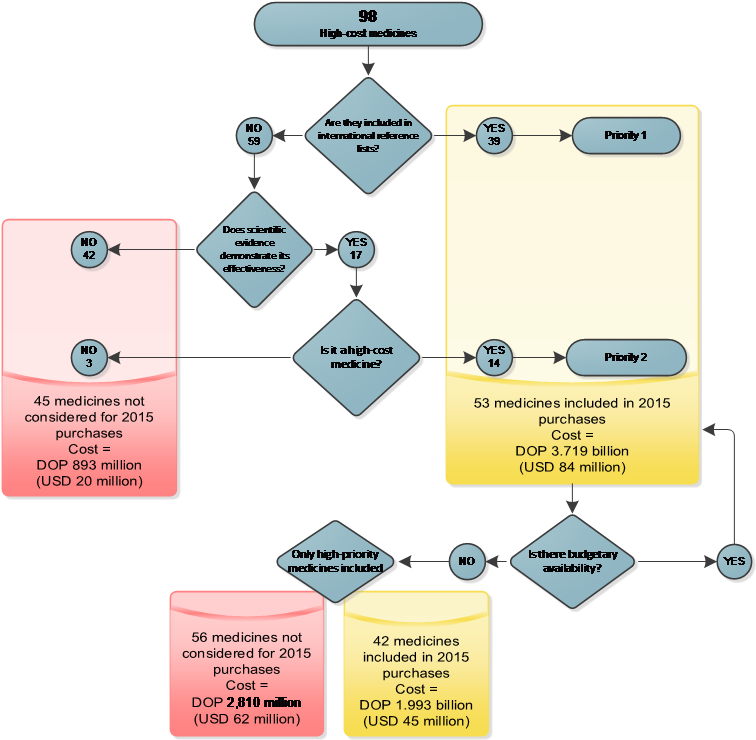 The consultant group agreed by consensus not to include 45 medicines in the estimate of needs for 2015 (figure 3), with a potential cost reduction of approximately DOP 893 million (USD 20 million), compared with 2014. During the workshop a prioritization for the acquisition of the remaining 53 medicines was also established. Considering the financial ceiling for purchases in 2015 and the implementation of price negotiation strategies, the final procurement plan included 42 medicines, at an estimated cost of DOP 1.993 billion (USD 45 million) (figure 3). The planned budget for the purchase of high-cost medicines in 2015 was reduced by DOP 2.810 billion (USD 62 million) relative to 2014. [i] Latest edition of the WHO Model List of Essential Medicines; list of prequalified medicines of the Pan American Health Organization Strategic Fund; list of prequalified medicines of the joint purchase system organized by the Council of Ministers of Health of Central America (Comisión de Ministros de Salud de Centro América, or COMISCA). [i] Until 2014 called the Protected Diseases Program (Programa de Enfermedades Protegidas).